I discovered a hymn while reading a blog called “The Inspired Funeral“. I discovered the blog from an article in the NY Times. The hymn is called “Be Thou My Vision” and is based on a sixth century Monastic text and an Irisih Folk Tune. And seeing as today is St. Patrick’s Day, I thought this would be a good thing to post. Here is a youtube performance with piano and cello. Truly haunting. Here’s a hint to my Lodge and OES friends in LA. You will be hearing this soon. There has been a FB meme going around lately where one is given a number and the receiver of said number is instructed to write n things about themselves. No one has bothered to send me a number, but I have decided to write about myself anyhow. I’ll let you know the number that I have given myself when I am done. I play the piano. It seems that I have always played the piano. I first started when I was about 7 years old. I took lessons until I was about 18. I am certainly no Artur Rubinstein, but I can read music and belt out a tune. 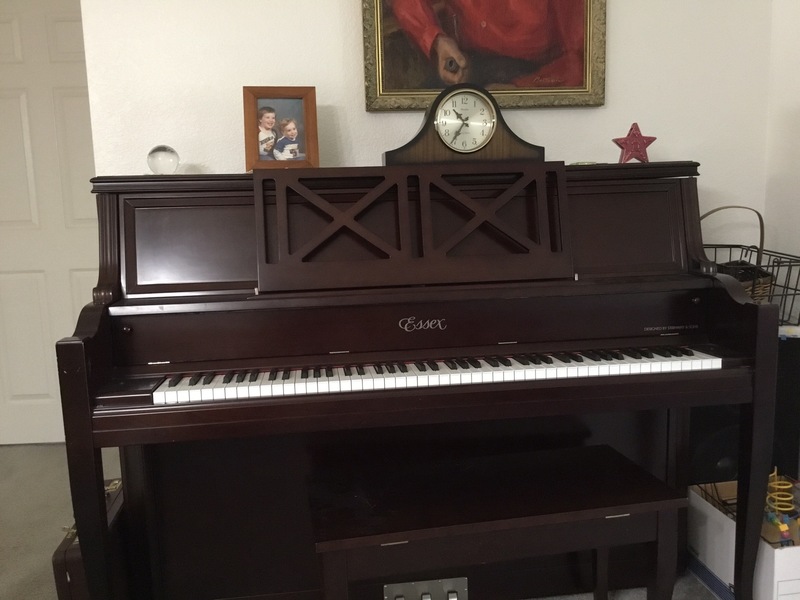 One of the first things that we bought when we moved to Cal last year was a Piano. When one of our lodge members found out that I played the piano, he asked me how long I had played. I told him that I had picked up a book at Barnes & Noble titled “Piano playing for dummies”. He believed me. There is no such book. Musical instruments are best learned as children. My two brothers and I all took piano lessons as children. I am the only one who still owns a piano and plays. Seeing that today is the 50th anniversary of John F Kennedy’s assassination. I was 15 at the time and I learned of the event while I was in religion class at BC High. I remember seeing the afternoon newspapers on the newsstands on the way home from school. Back in the day there were such things as afternoon newspapers. And while we are talking about 50 year anniversaries, next year will be my 50th reunion for BC High (Boston College High School). I have no use for high school reunions and have no intention of attending. I have little or no use for the Roman Catholic church, though I like the new Pope. I’ve told a few of my RC friends that I would return to the RC Church when the Pope ordains women and allows priests to marry. Oh yeah, add LGBT weddings too. I doubt that I will see that in my lifetime. I am active in Masons. I am a member of LA Harbor Lodge F&AM #332 in San Pedro and Thomas Talbot Lodge AF&AM in Billerica, MA. So I am a bi-coastal Mason. My wife and I are members of OES (Order of Eastern Star) which is a fraternal organization for men and women. I play the piano for both Lodge and OES. I was born in Brighton, MA at St. Elizabeth’s Hospital and spent my early years living in Brighton and West Roxbury (parts of Greater Boston). I taught math for a couple of years at the Junior and Senior high school level in the early 70’sin Boston. I wasn’t very good at it. I have great respect for good teachers, especially good math & science teachers. I was good at math, just not good at teaching it. I worked for Digital Equipment Corp (DEC), Compaq, and HP before getting laid off in 2008. To this day, the layoff still bugs me. People were being discarded like used junk. Ken Olsen would never have done that. When people asked me what I did at DEC, I tell them that I fixed stuff. The “stuff” that I fixed were complex computer systems.I also worked as a contractor for IBM for a couple of years, once again fixing stuff. I left in 2012 to retire and moved west. I live in San Pedro with my wife of 35 years along with my mother-in-law. We moved out here to take care of her mother who is 89. I have found that I can make one woman happy. Making two women happy is an extraordinary challenge. So I try to bite my tongue and STFU. Lodge (for a couple of nights a month) gives me a chance to get out without the ladies in my life. I truly don’t understand how the Mormons (and other polygamous cultures) could possibly live with more than one wife. The same goes for a wife and a mistress. I attend the Ocean View Baptist Church in San Pedro. I would prefer going to a UCC (Congregational) church, but this is the church that our extended family goes to. So I am okay with that. I have started to push back a little bit on LGBT issues. The pastor is good guy and listens to my point of view. My wife and I are registered Democrats. My Mother-in-law is a Republican. We rarely discuss politics. Explaining why Obamacare is a good thing to my mother-in-law is like explaining algebra to Boomba (Boomba is a chocolate lab retriever). Also, for the same reason we don’t watch Fox News (or MSNBC or CNN) EVER. I would sooner have root canal surgery without anesthesia. People often ask my wife and I whether or not we met on the San Pedro or Boston. Here’s the story that has been told and retold. We met in Boston at a MIT folk dance. One of Paula’s roommates was dating one of my roommates. That was November of 1976. We were married in October 1978. We lived in Billerica for the next thirty odd years. Paula can embellish the story a bit. She would be happy to do that. I keep in touch with all of our east and west coast friends by way of Facebook. The move would have been a lot more painful to me without it. There, that’s enough. 13 it is. That’s a good number.